Is it possible to trap some electricity in the object even though the object is grounded? For example if we ground a conducting sphere over a resistor, will all electricity leave the sphere once it's grounded? let's say the sphere now gets charged, will it become neutral ? I apologize for asking such a simple question. The sphere acts as a capacitor of value \$C\$ charged at a voltage \$V_0\$ = \$Q\over C\$ relative to ground. When you connect the resistor it will discharge towards zero (relative to ground) exponentially, at a rate dependent on the RC product. For all practical purposes, it will reach "close enough" to zero within 5 or 10 time constants, so for a sphere the size of a baseball a few inches from the earth and a resistor of 10 Meg ohm (quite high), it will be effectively at the same potential within the blink of an eye. The voltage everywhere on the sphere will be the same since it's conductive and no current is flowing. Mathematically, though, (and ignoring charge quantization and thermal noise in the resistor and such like) it never quite gets there. If there is impedance between the conductor and ground, then it will take a certain amount of time for the conductor to discharge. How much time depends on the resistance and inductance of the path to ground and any capacitance that may exist in the system. Since there is no perfect conductor it is impossible for something to discharge instantaneously. Also, you used the phrase, "will all electricity leave the sphere once it's grounded?" This isn't the correct way off looking at it. The object that is grounded will have the same energy density and potential energy as your ground. Not the answer you're looking for? Browse other questions tagged resistors grounding charge discharge or ask your own question. How is it possible that if I combine 100 Ohm resistors in different ways, I get _LESS_ resistance than original? Does electricity always flow in a closed loop and why does current flow to ground? 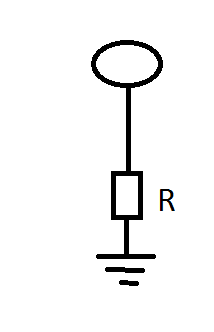 How do I reverse-bias a resistor?